Banners are a great way to advertise your business or event. Used either indoors or out. Banners can be as simple as single color lettering on a solid background to full digitally printed using your logo and design. Made up of long lasting vinyl frame components and a highly weather resistant sign blank, the post frame sign is a low maintenance way to display your message. 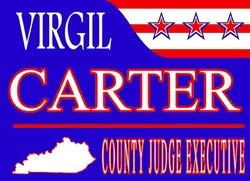 Political/Yard Signs are perfect for political campaigns and business advertising. The standard sign is 24 inches wide by 18 inches high and includes a metal step-stake, other sizes are available upon request.